It was an honor certainly fit for two racing legends. The legacies of Don and Mel Kenyon will forever be cherished thanks, in part, to a commemorative marker unveiled in April. Mel Kenyon drove Midget cars, as well as IndyCars. The unveiling took place on April 15th, Mel Kenyon’s 85th birthday. Both men were on hand to uncover the honor, and discuss some of their racing memories, with many of their fans, members of the community, and racing enthusiasts. It’s still uncertain where the marker will be placed. 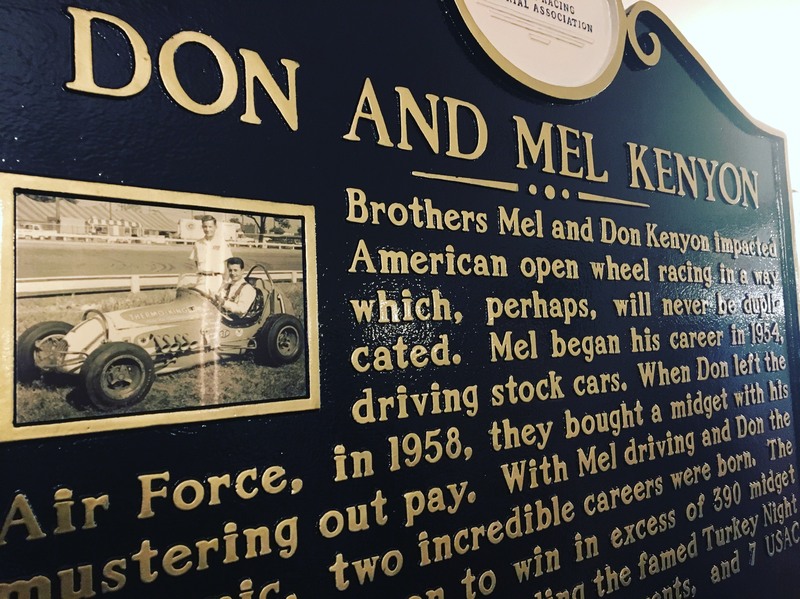 Brothers Mel and Don Kenyon impacted American open wheel racing in a way which, perhaps, will never be duplicated. Mel began his career in 1954, driving stock cars. When Don left the Air Force, in 1958, they bought a midget with his mustering out pay. With Mel driving and Don the mechanic, two incredible careers were born. The duo would go on to win in excess of 390 midget races worldwide, including the famed Turkey Night Grand Prix twice, 110 USAC events, and 7 USAC Midget Championships. In a 1965 accident Mel was severely burned, losing part of his left hand. That didn’t stop the Kenyon’s. With their Dad’s help, they created a device that allowed Mel to drive. He went on to his greatest triumphs, and competed in 8 Indianapolis 500’s. Mel has received many awards, but he’s quick to admit that his relationship with God is more important than all the recognition. It’s what brought him comfort as he cared for his wife in the last years of Marieanne’s life. Originally from Dekalb Illinois, the Kenyons have proudly made Lebanon their home since the 1960’s.